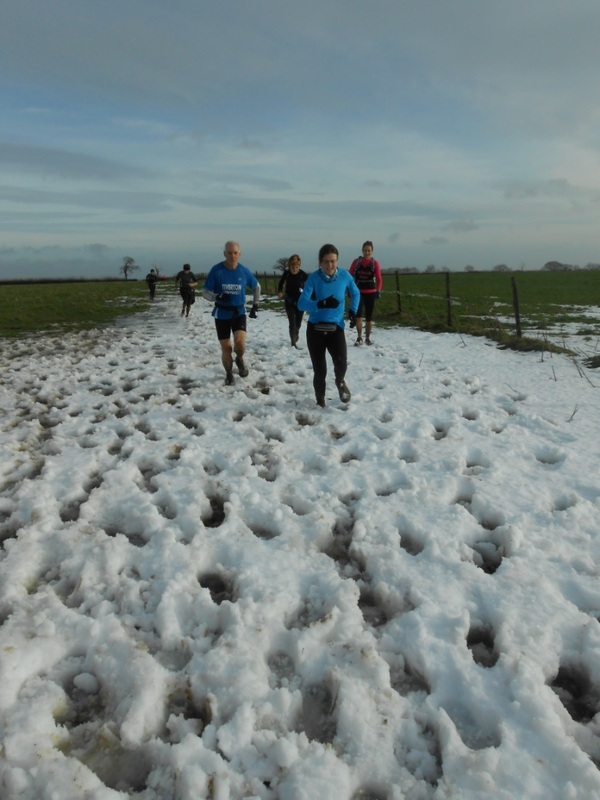 Would the run be on or not? 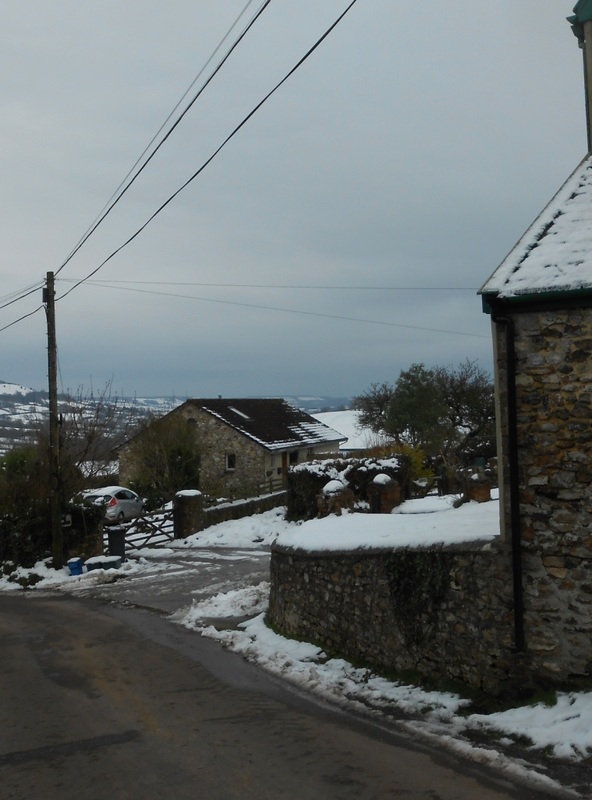 As the one having to make the final decision I was pinning my hopes on the accuracy of the Met Office forecast which said that heavy rain and a thaw would come in on Friday night. 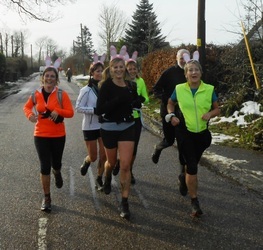 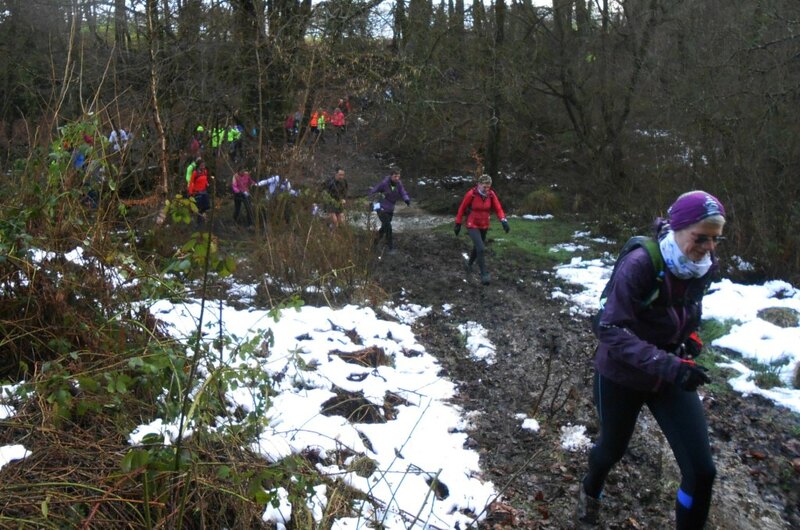 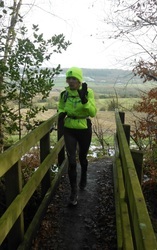 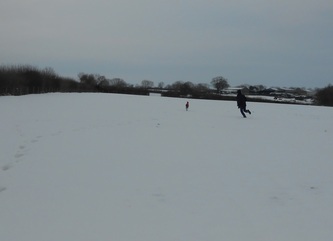 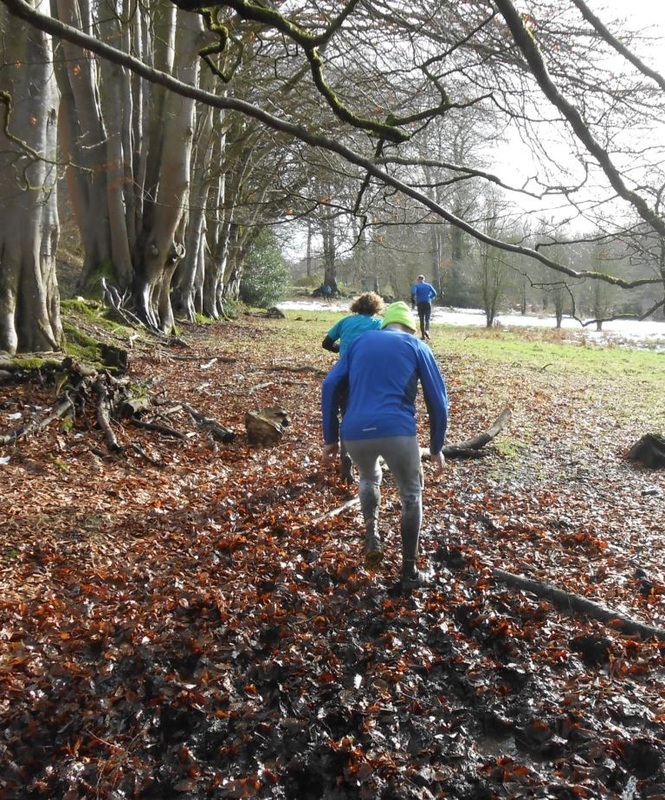 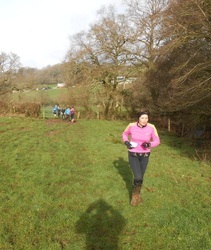 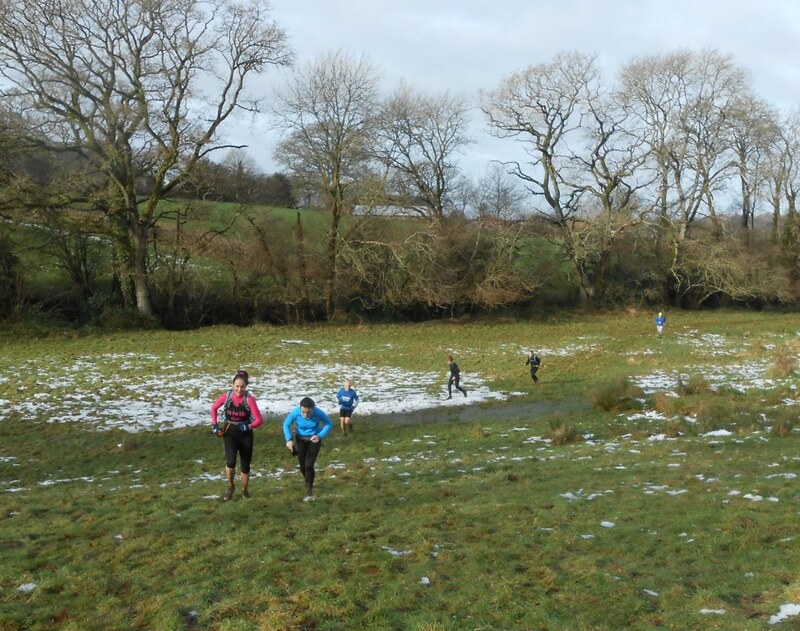 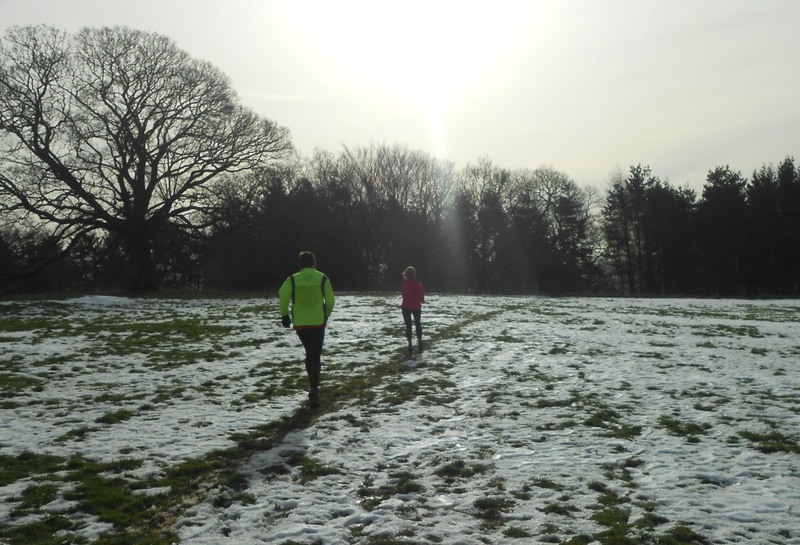 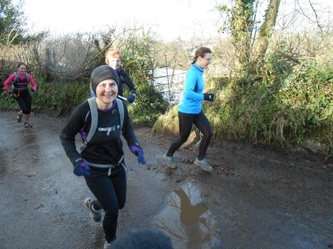 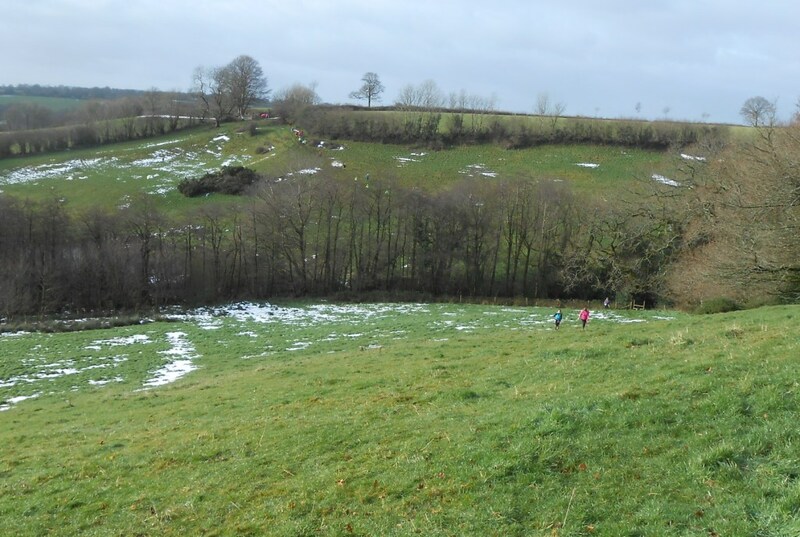 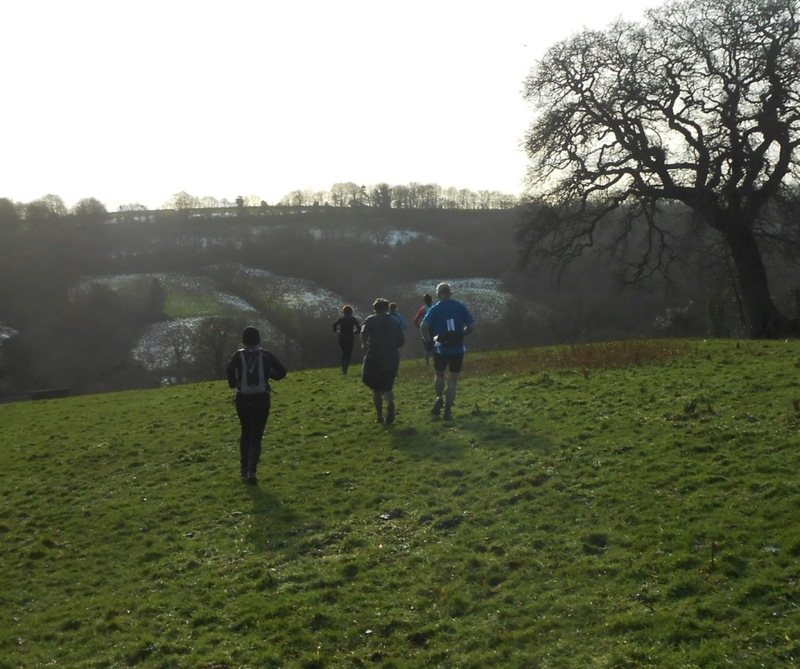 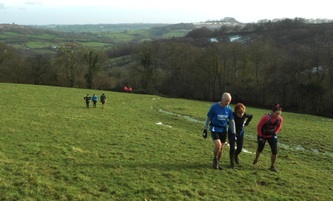 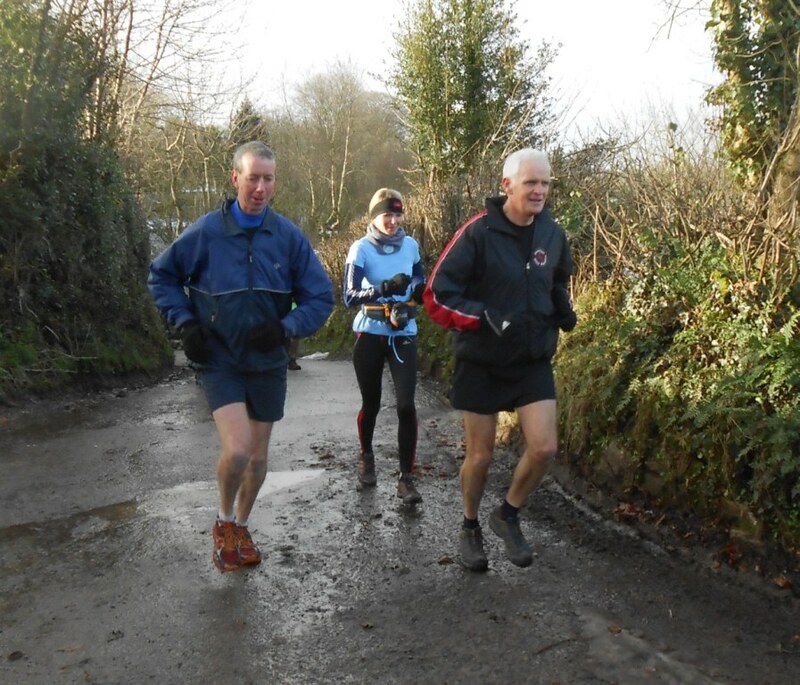 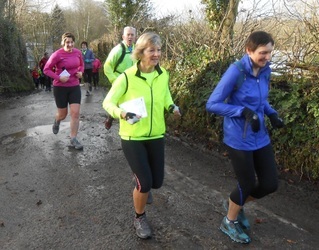 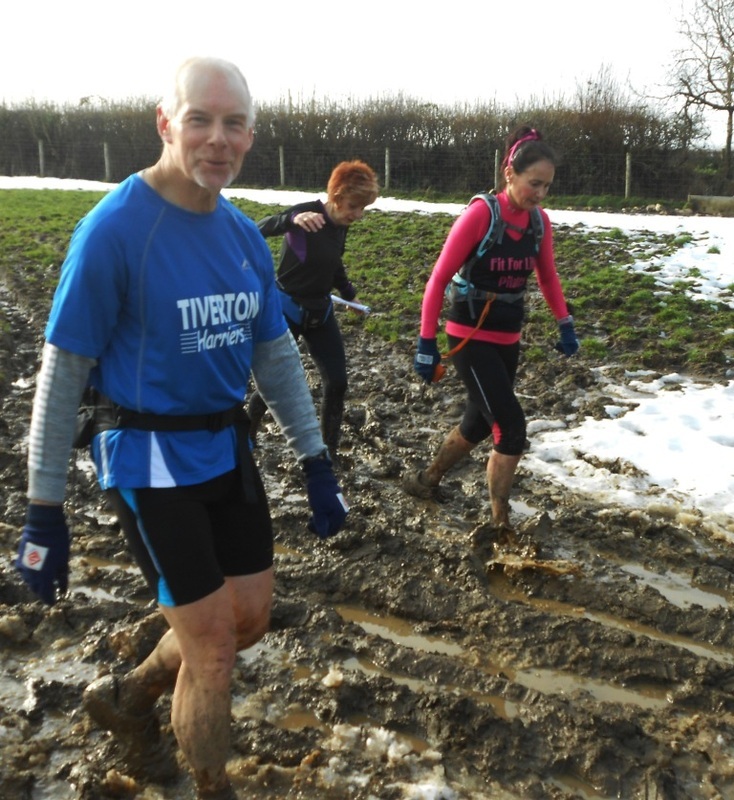 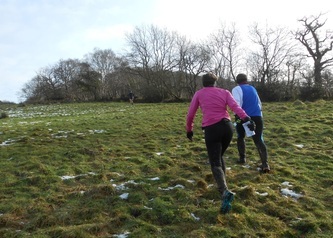 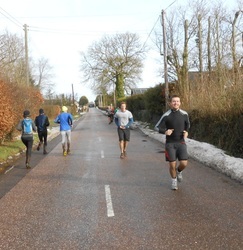 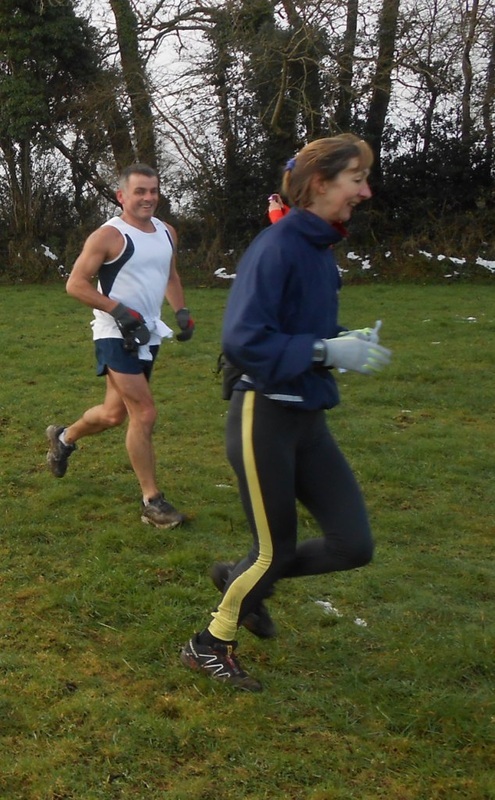 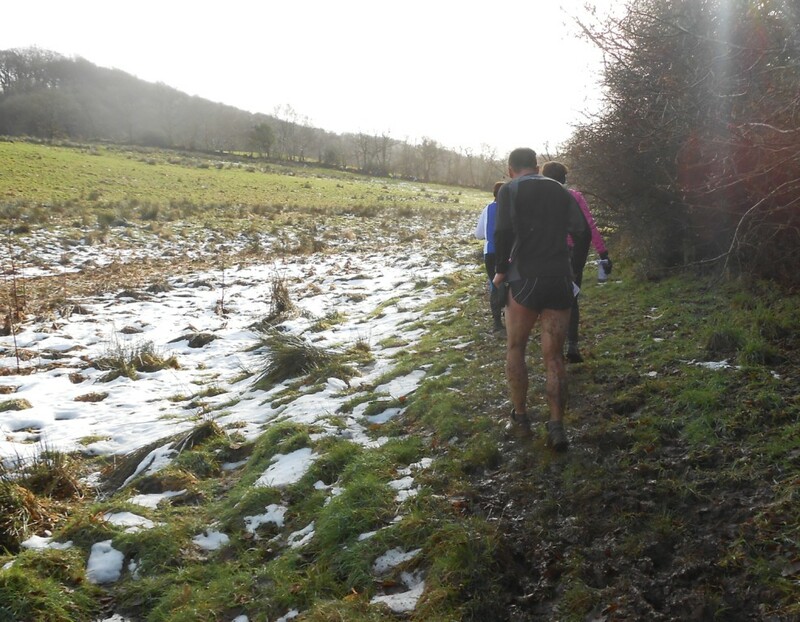 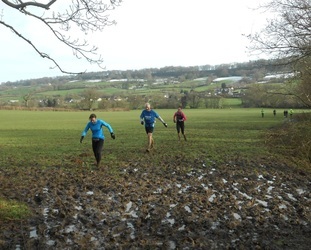 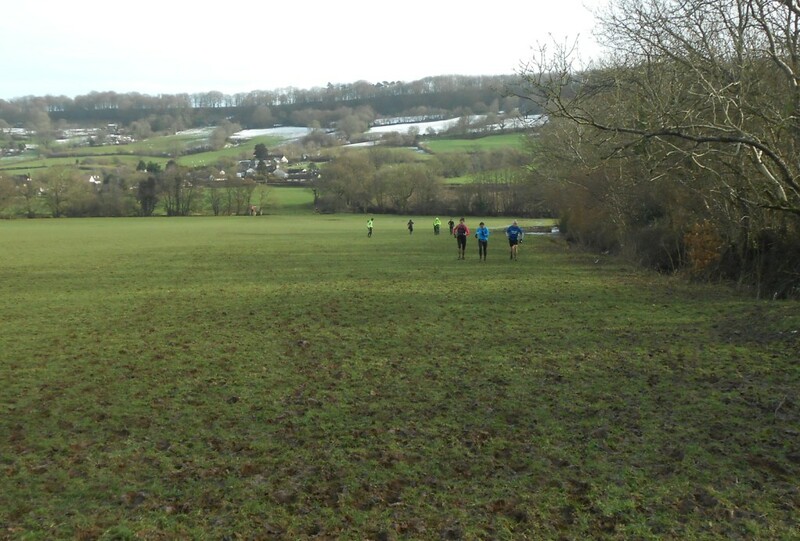 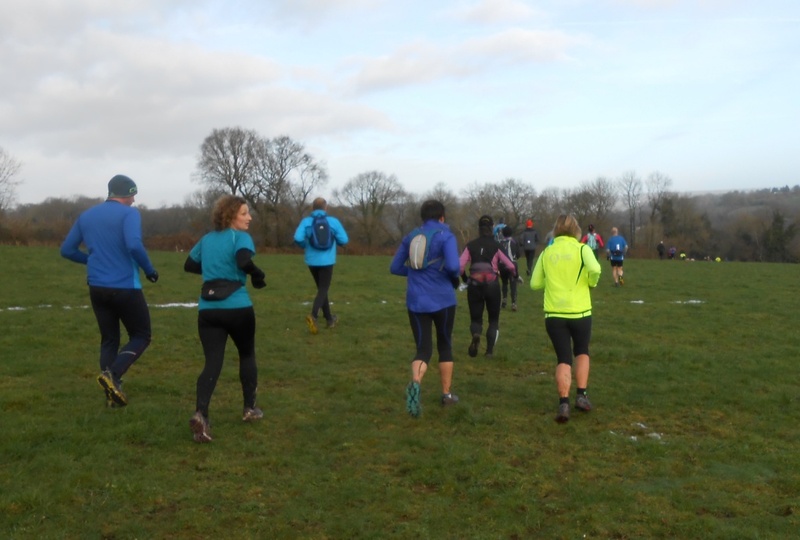 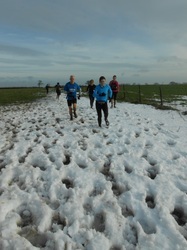 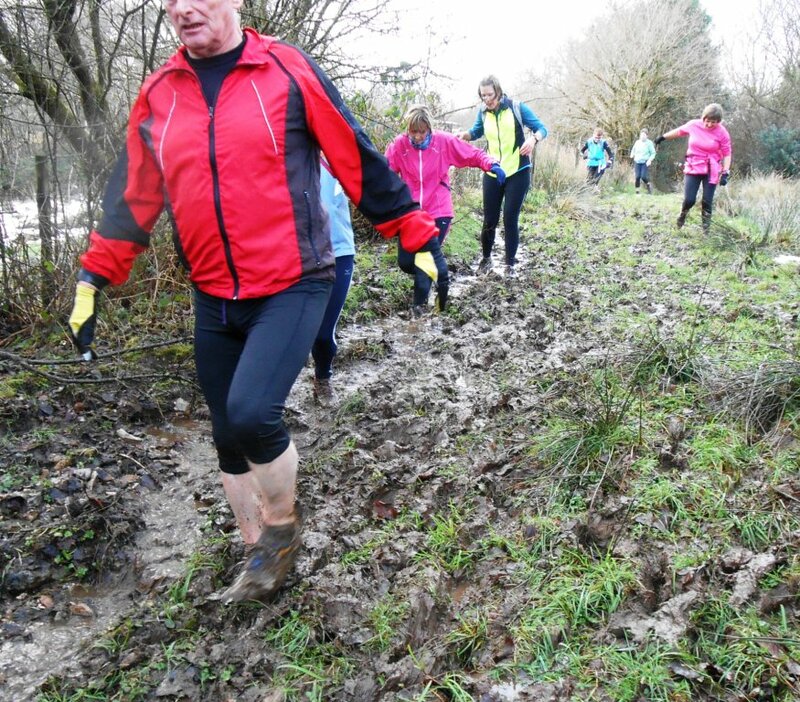 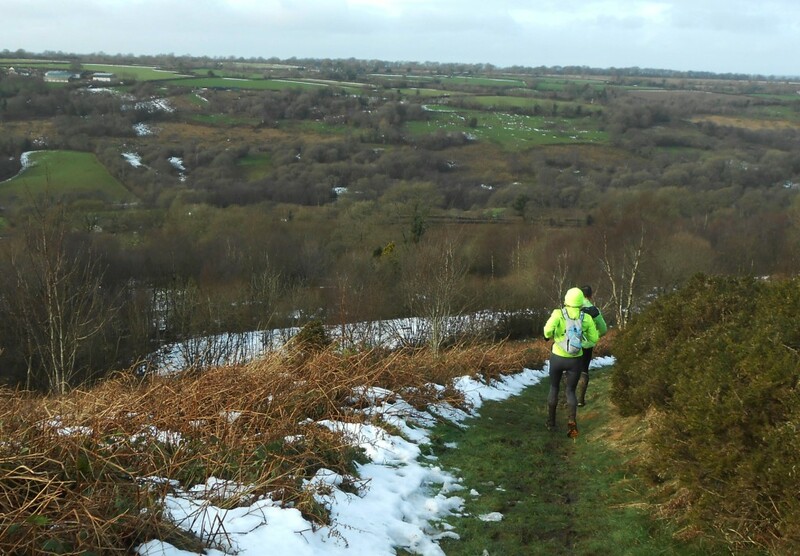 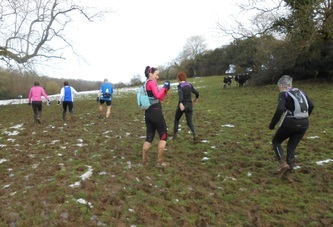 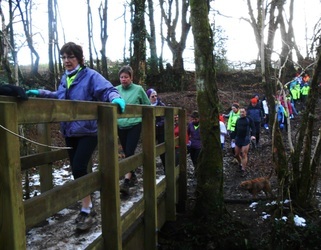 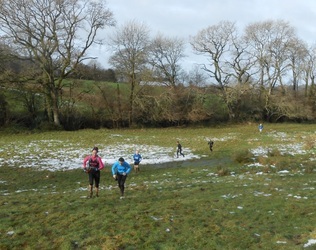 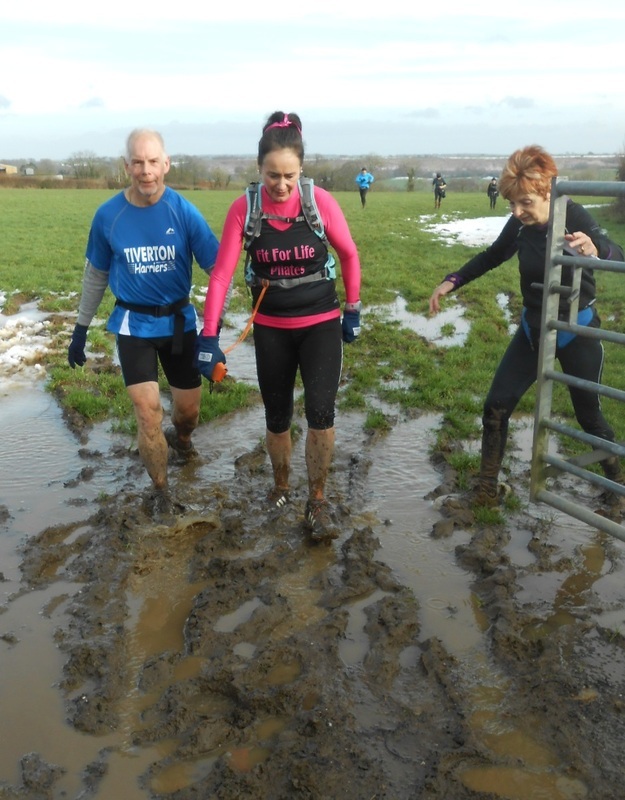 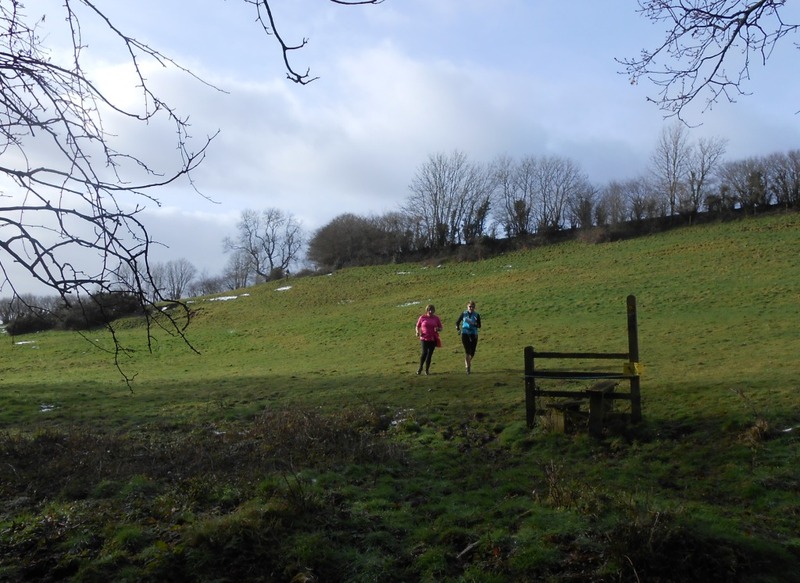 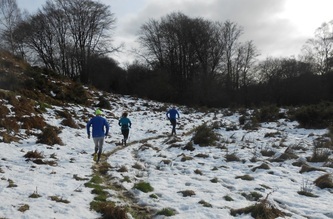 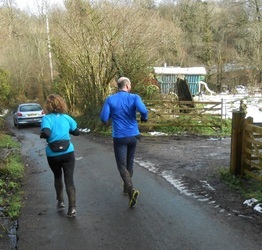 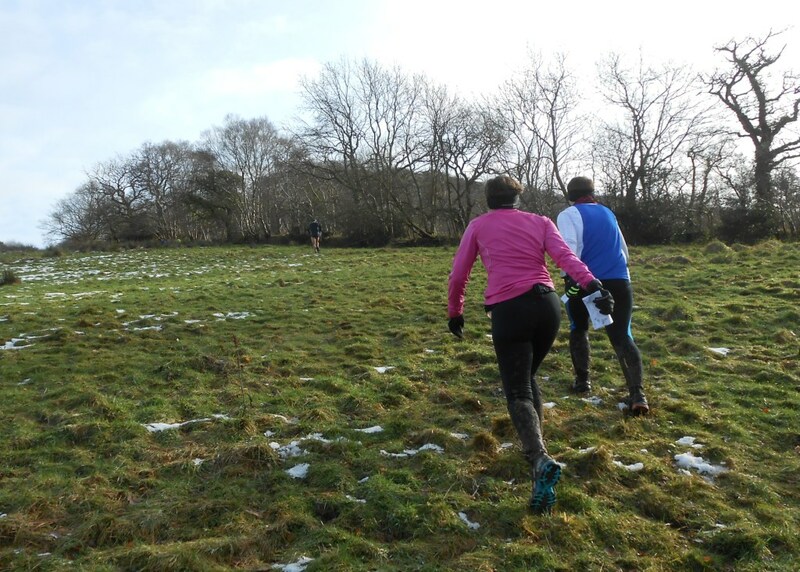 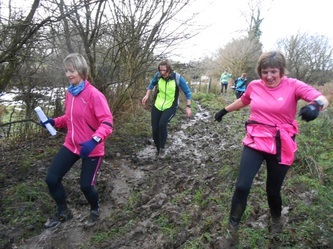 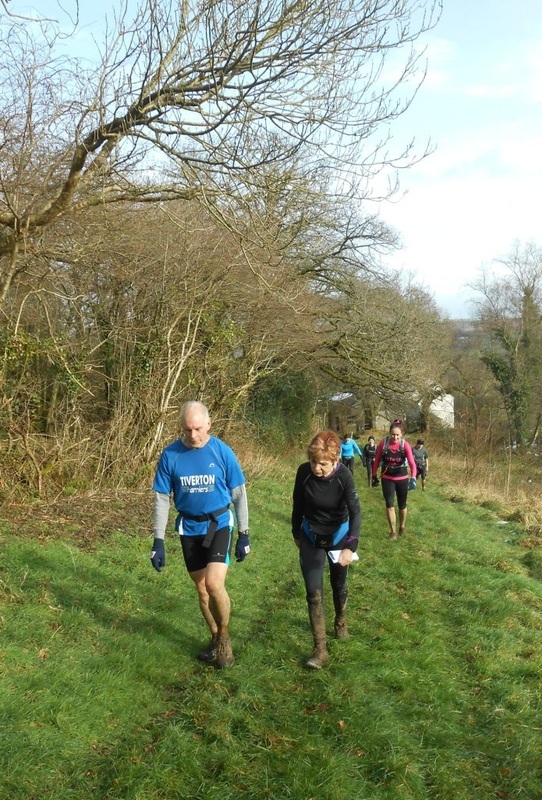 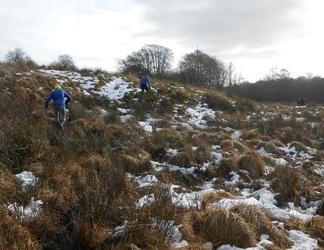 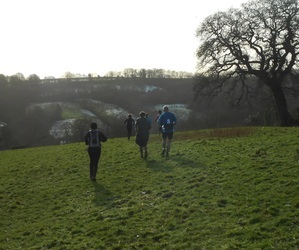 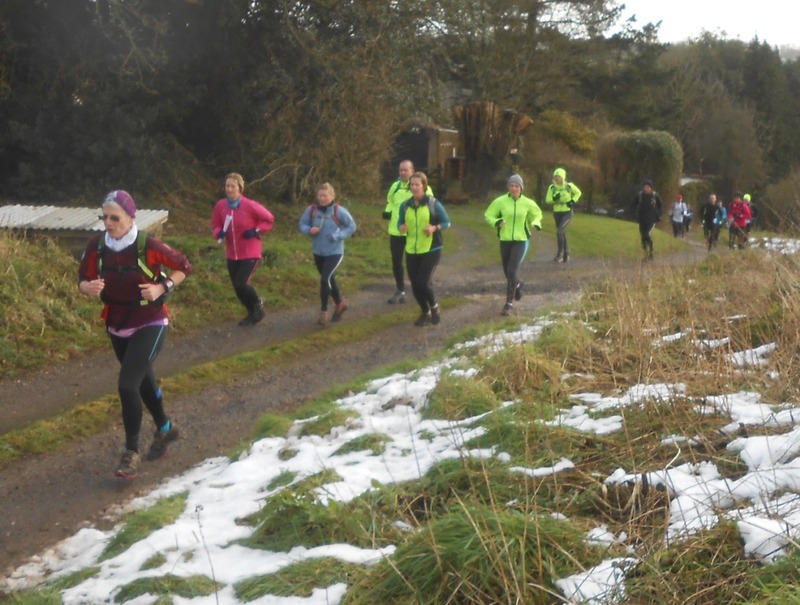 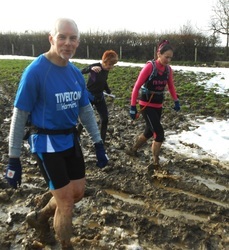 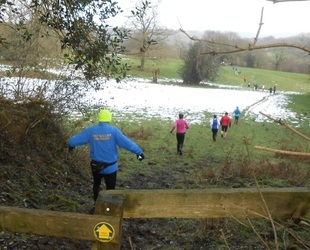 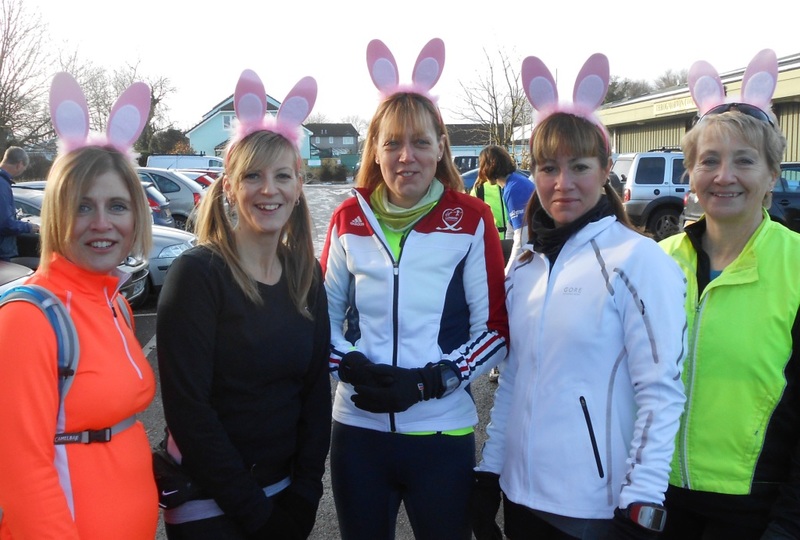 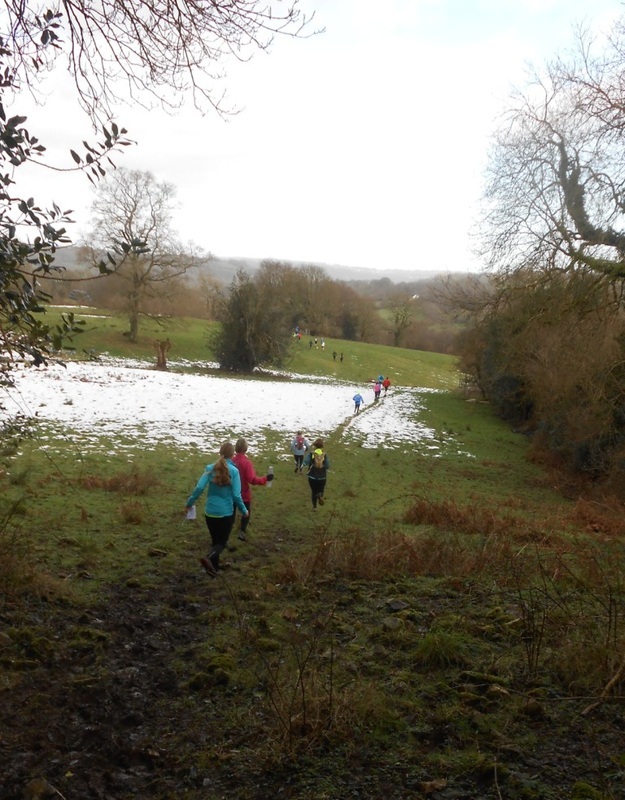 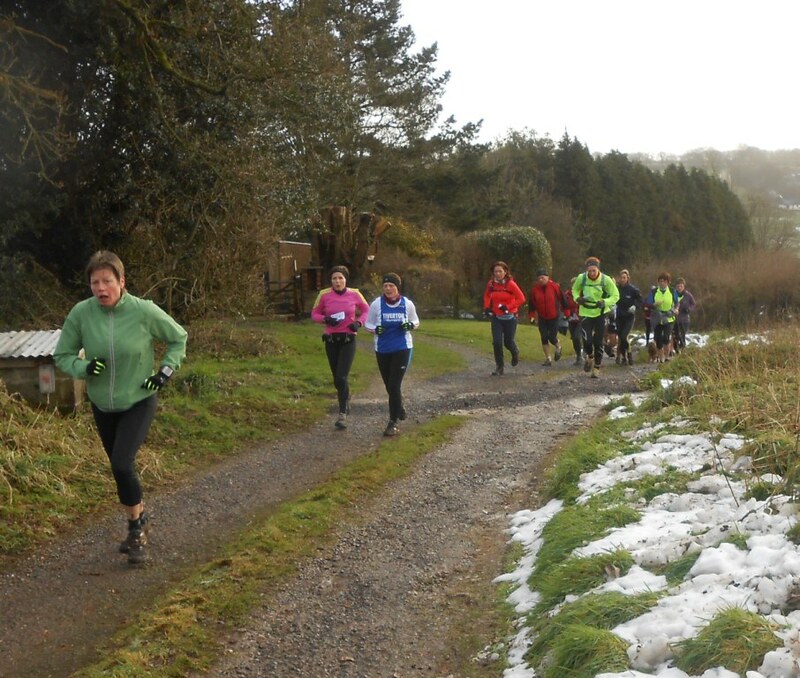 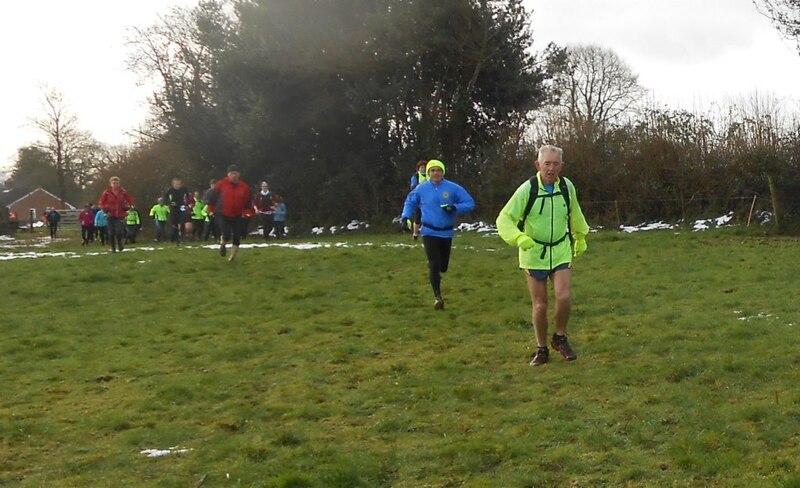 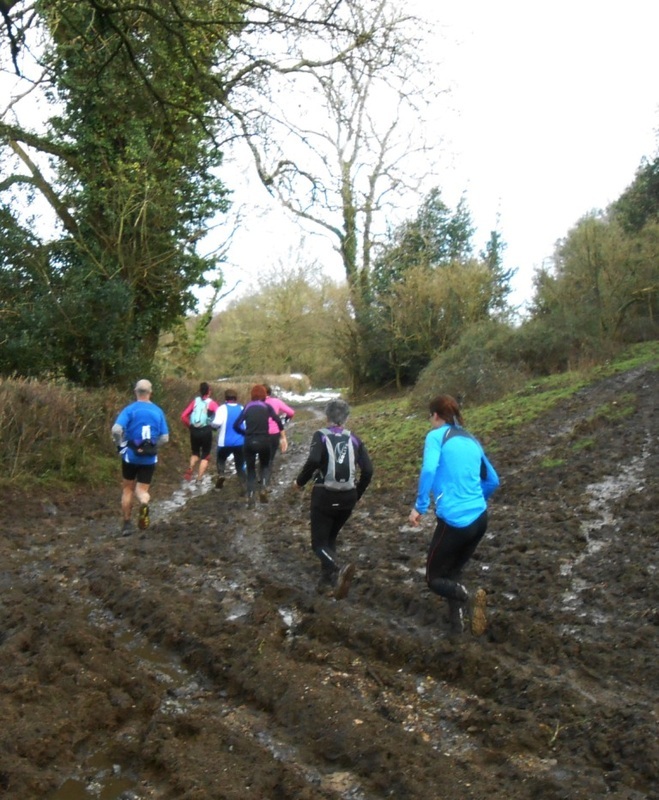 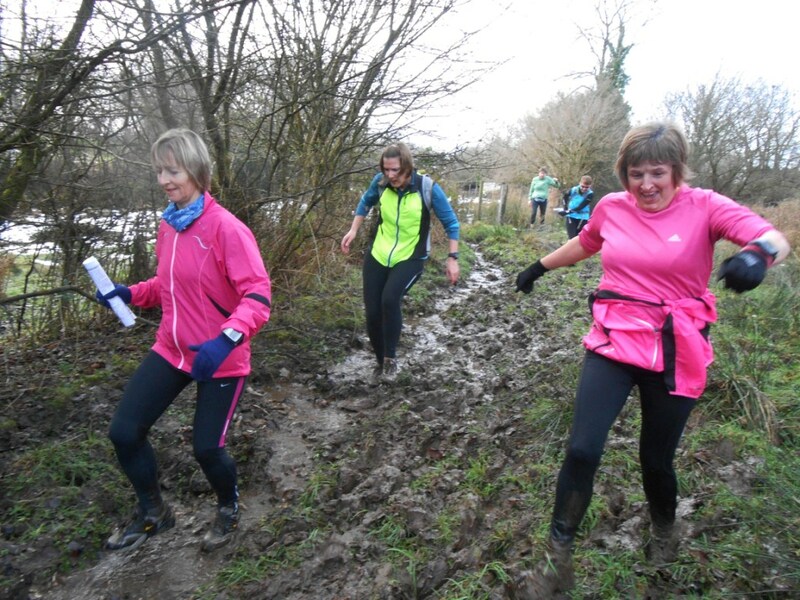 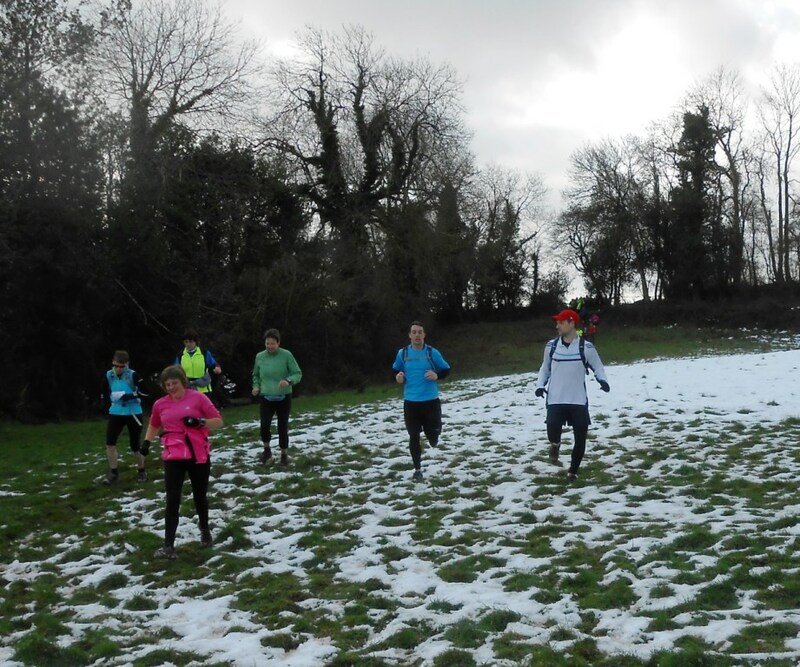 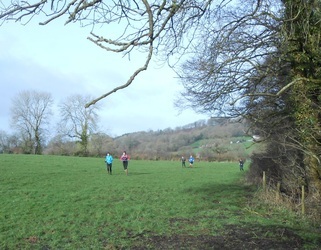 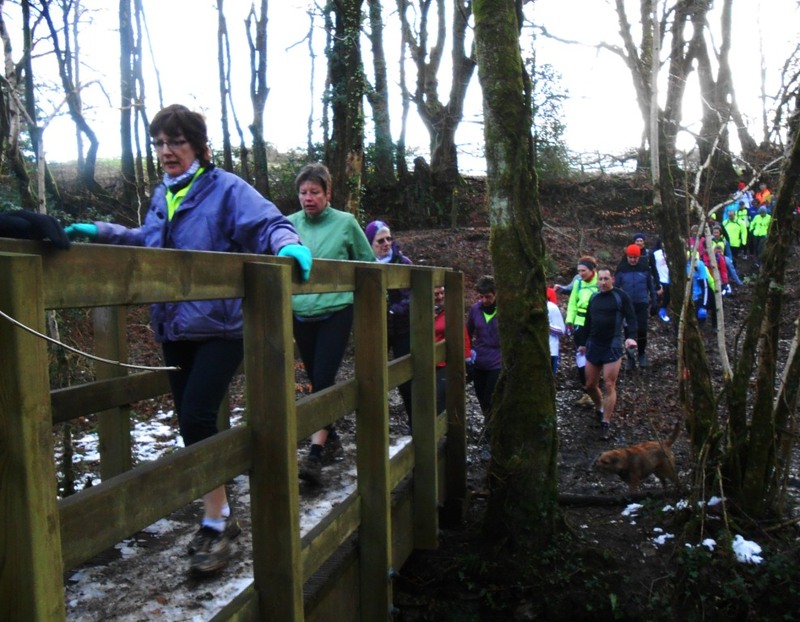 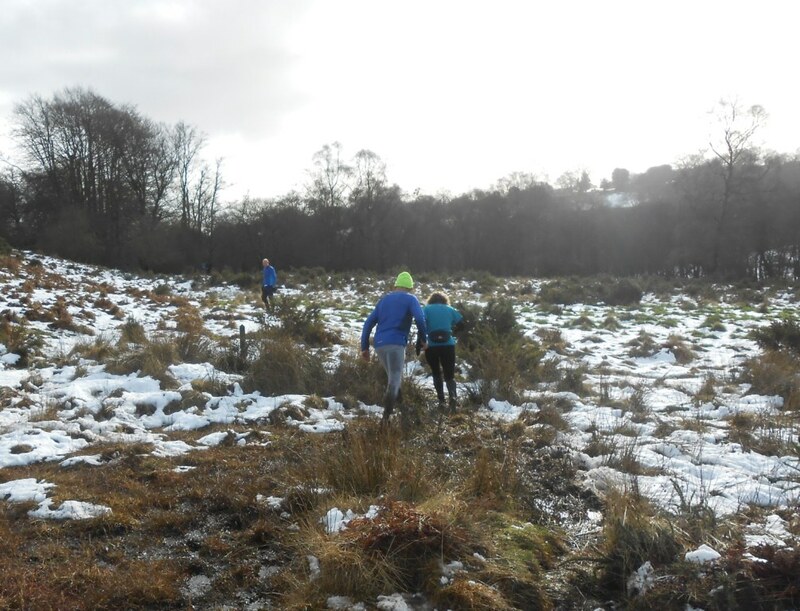 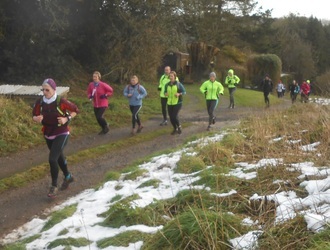 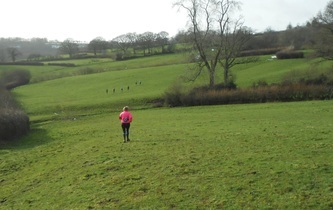 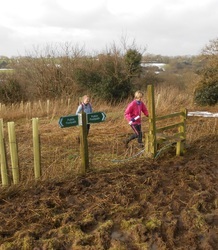 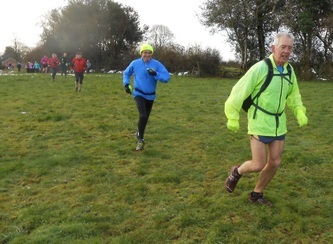 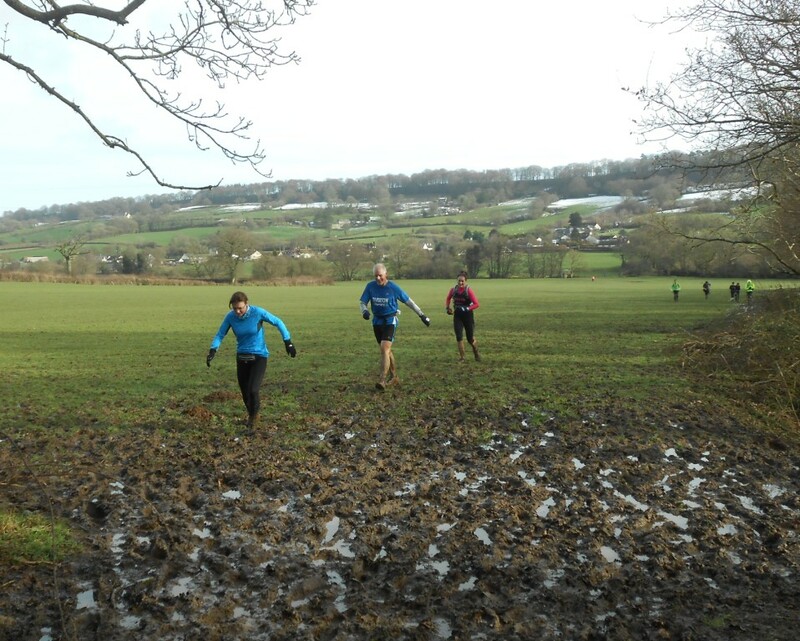 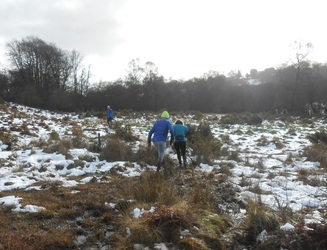 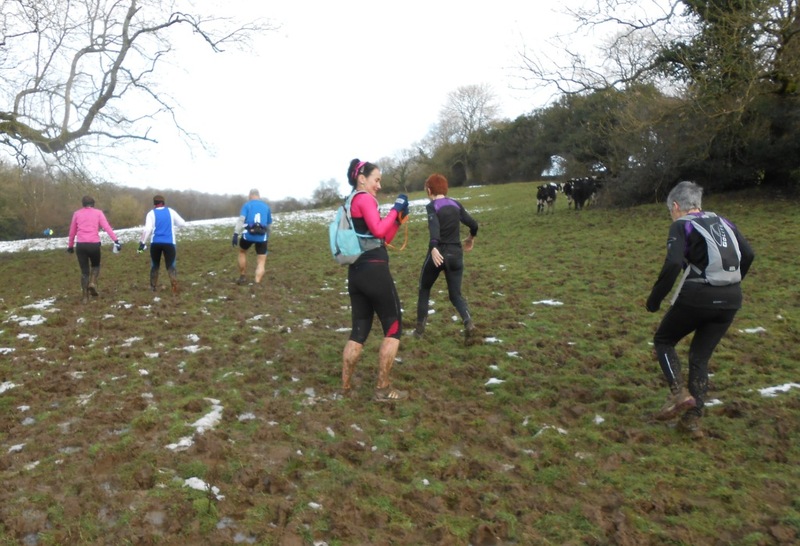 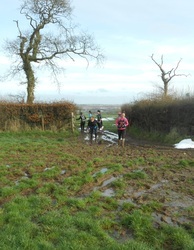 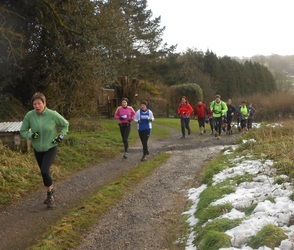 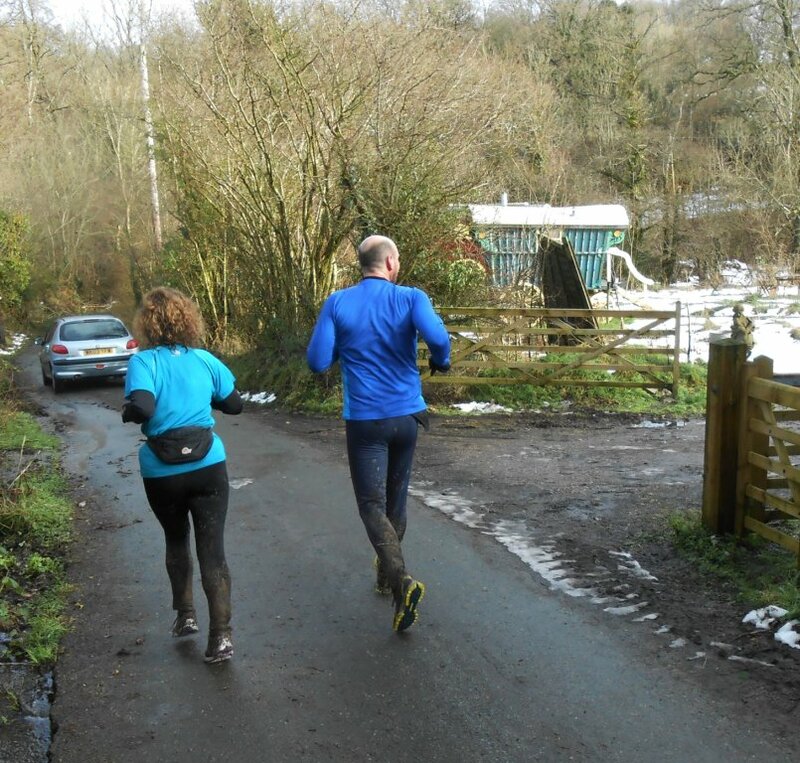 I'd been out to inspect Leg 4 on Friday morning and found 6-8 inches of snow on the fields but not really a problem for hardy runners- see photos below. 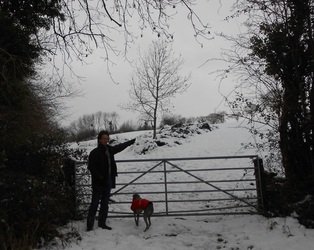 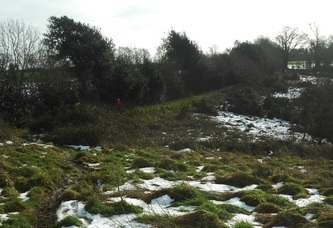 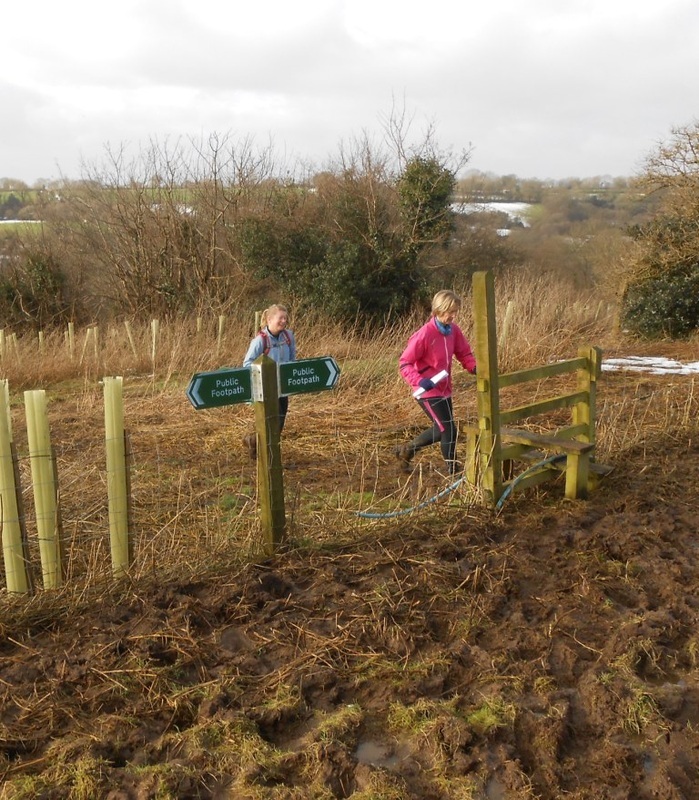 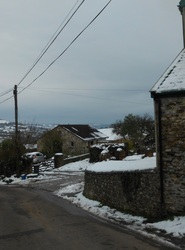 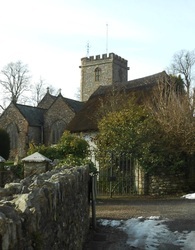 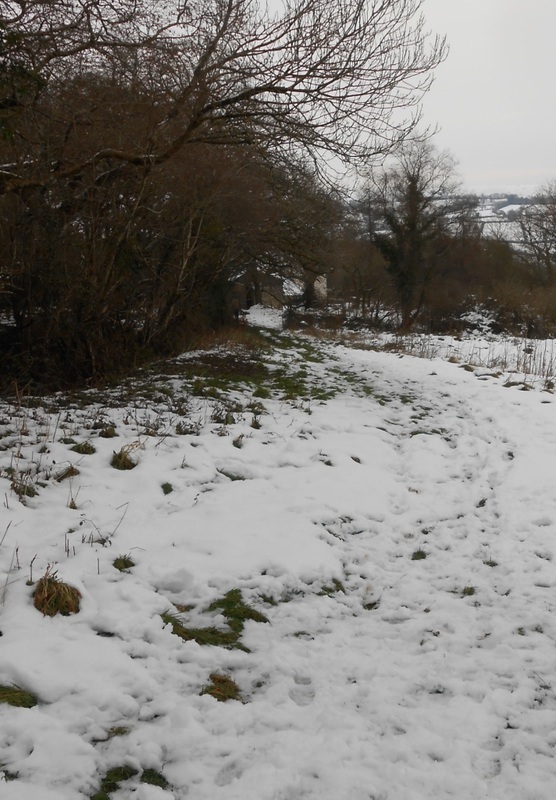 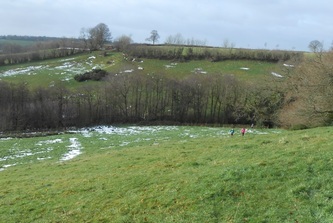 But then I heard that the snow at Smeatharpe was deeper and that ice and snow was making a lane we use too dangerous; what is more as rain moved into Honiton late on Friday up at Smeatharpe it was snowing again! 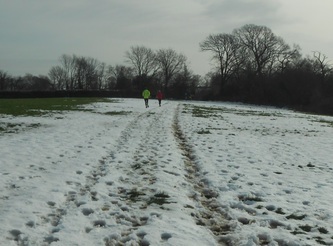 I went to bed wondering if we could re-route part of the course (probably not) or could I send out trailblazers early to show where the paths went. 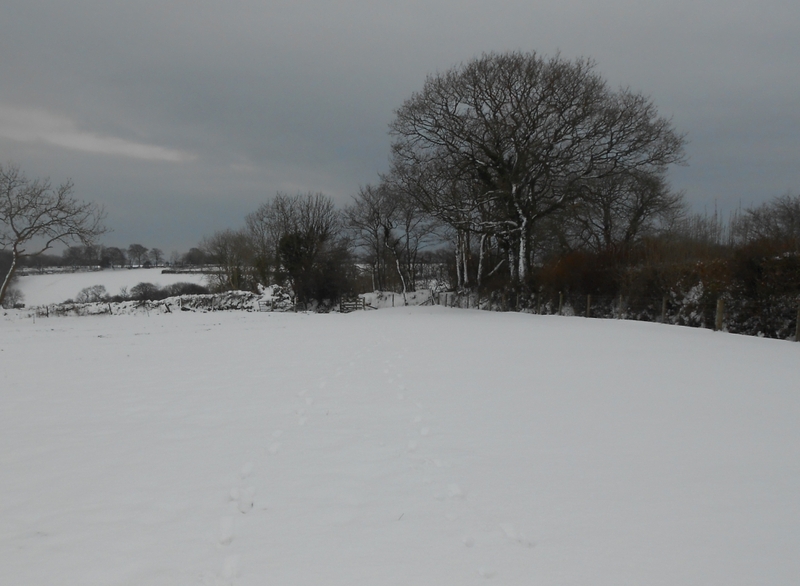 But fortune and the Met Office smiled on us and by morning the snow had all but disappeared and mud, acres and acres of it had taken its place. 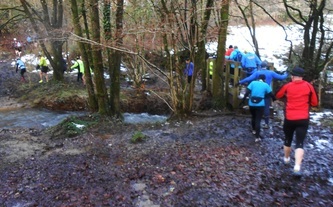 The heavy rain brought its own problems with floods preventing some people from making the trip. 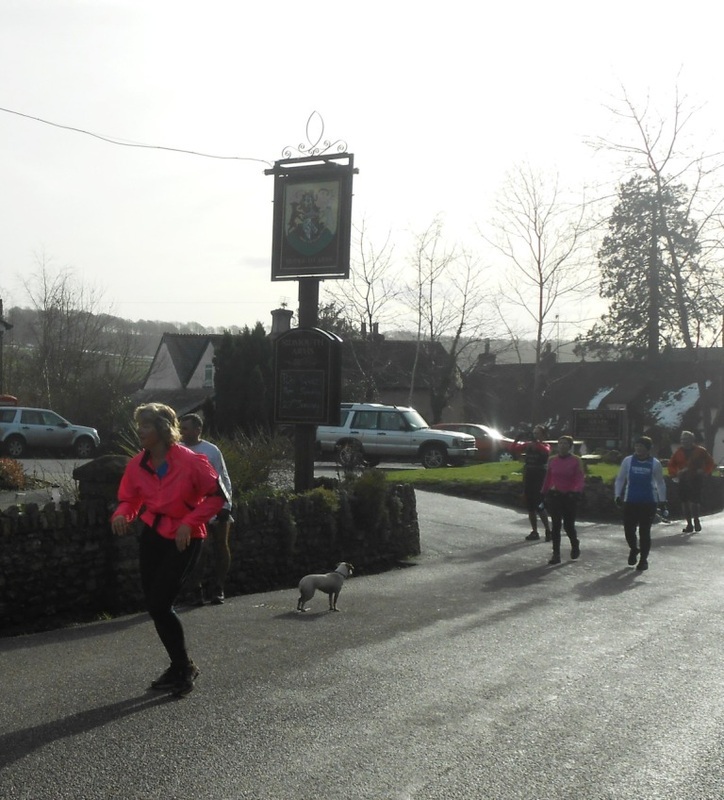 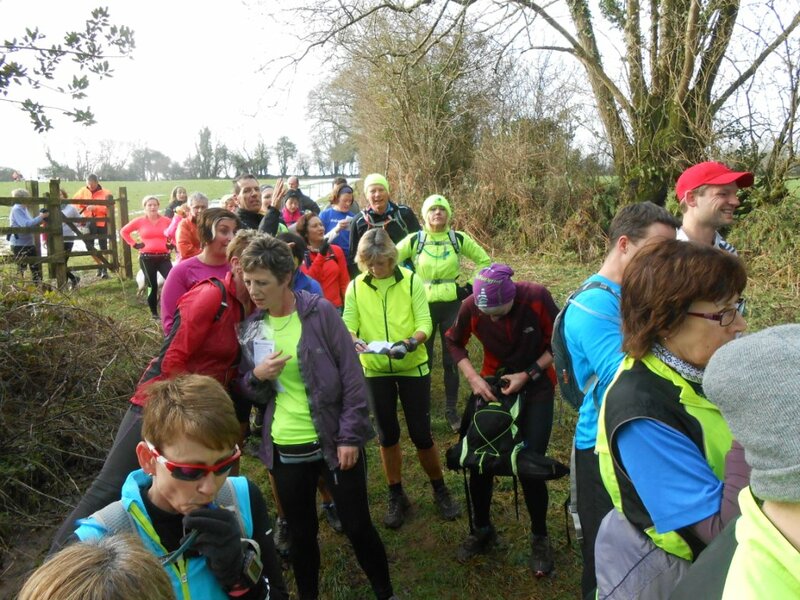 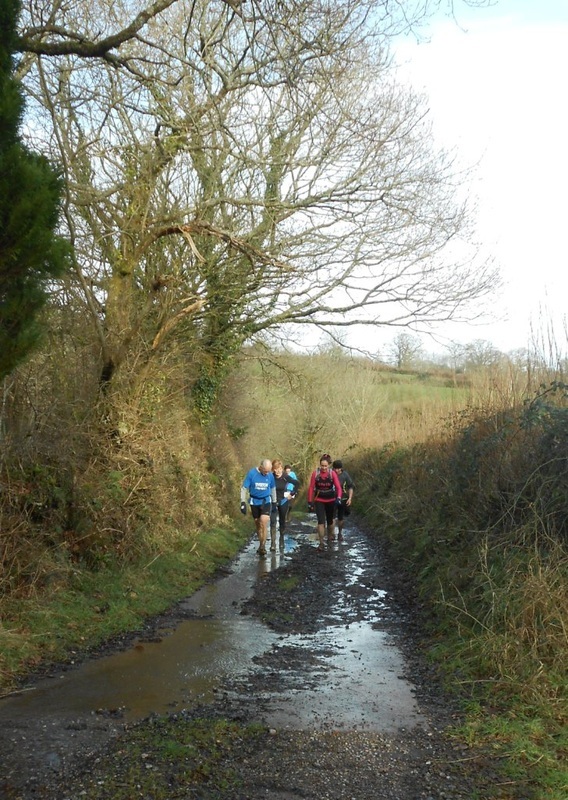 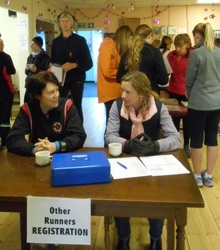 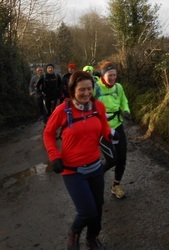 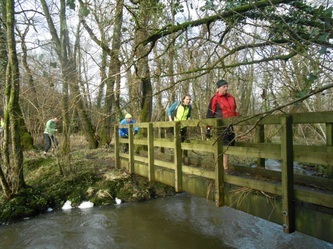 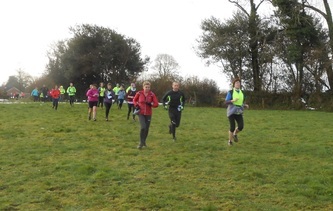 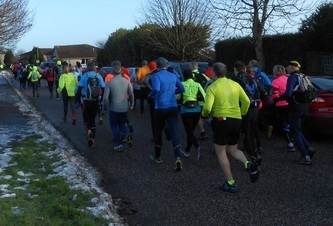 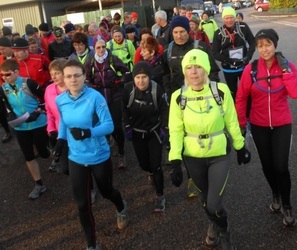 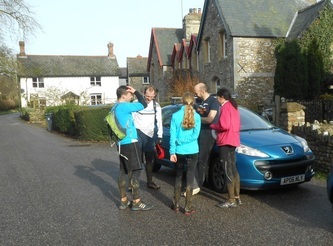 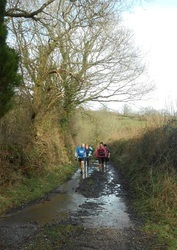 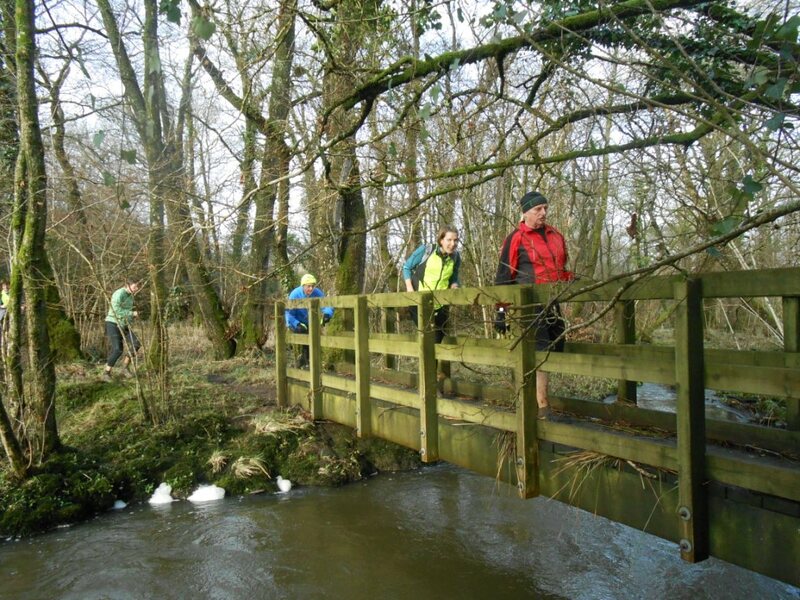 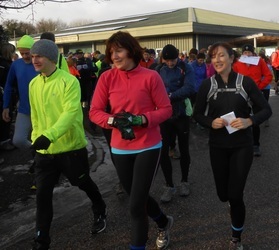 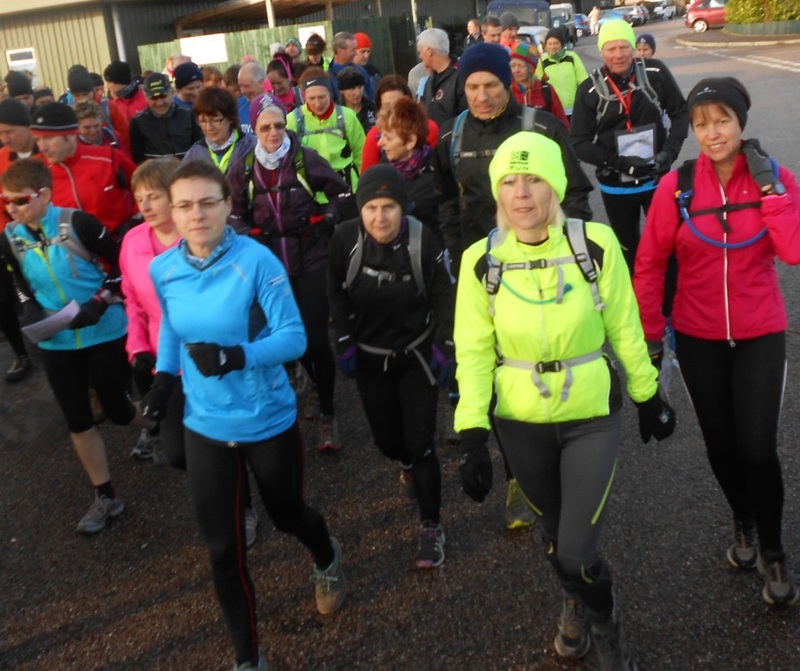 Nevertheless 131 intrepid runners set off from Dunkeswell on a bright, dry and sunny morning. 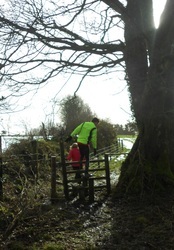 Apart from the roads there was scarcely any part of the route where you were not either ankle deep in water or trudging through brown glue - very tiring but great fun. 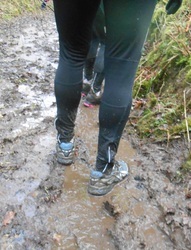 Every year the instructions are modified to try and prevent people getting lost e.g Leg 1 No.15. 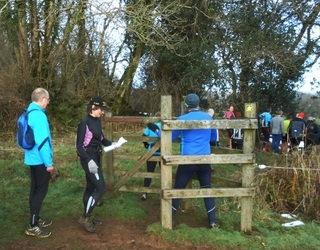 After 100m go through gate on left (FP sign) across field to gate. 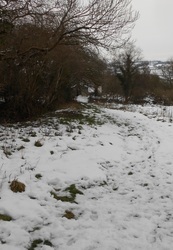 Along field (not into the next one) then LEFT down to footbridge. 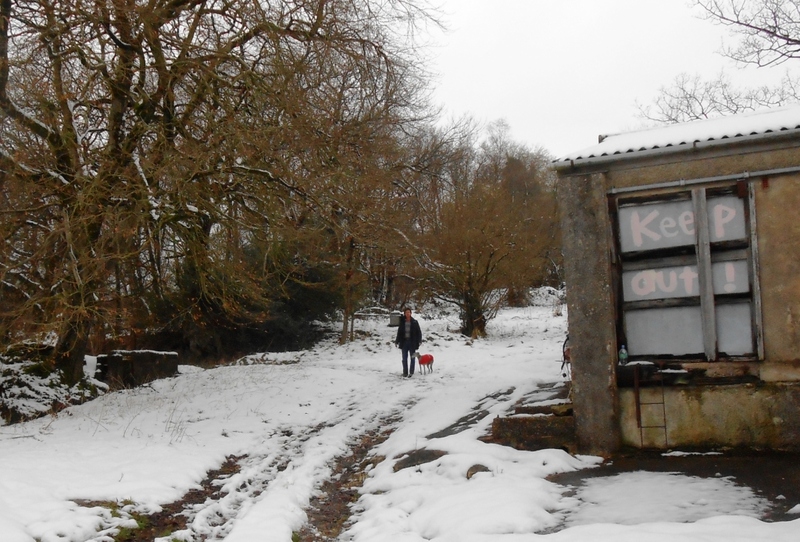 "Not into the next one" it says but inevitably some did, but no one got seriously lost. 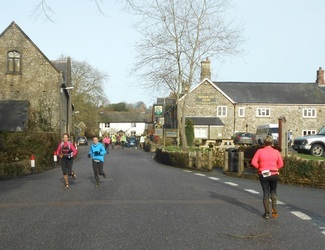 We got used to having muddy, wet and very cold feet with the roads bringing some respite but the the road from Smeatharpe posed a new problem with surface water concealing at least one pot-hole, causing yours truly and others to stumble and bringing down one unlucky runner who had to hobble back to the village hall with a sprained ankle to get a lift back. Another lady fell somewhere on this leg, carried on to finish the whole 16 miles, but then needed stitches in her knee - cross-country runners are made of stern stuff. The Smeatharpe WI + gents did us proud again, getting hot pasties and mulled cider in our hands almost as soon as we walked through the door. 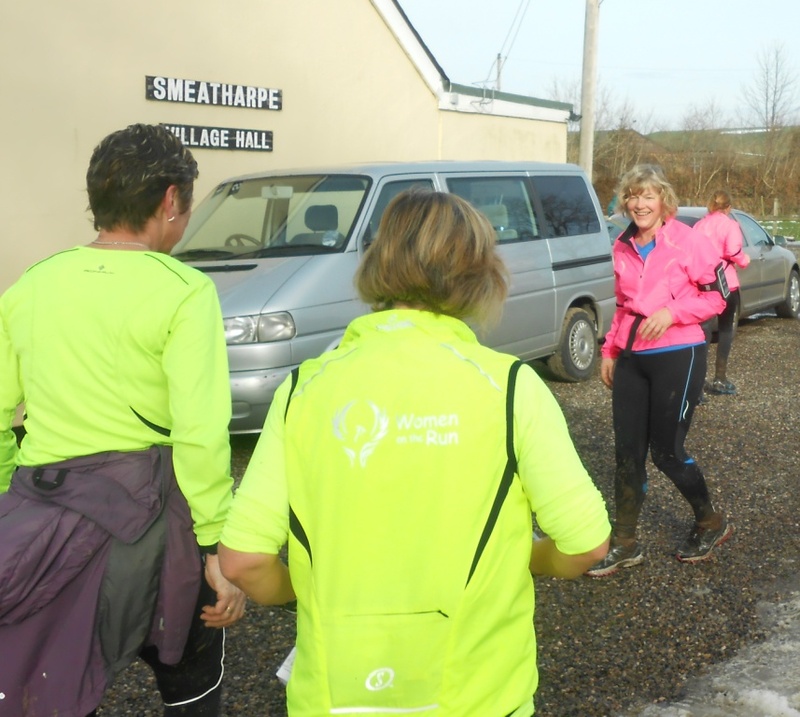 The trip down to Upottery was a good respite and the final stop for the 10 milers who then enjoyed a lift back to the finish in the minibus. 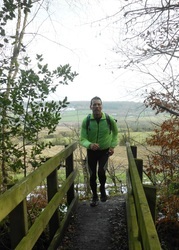 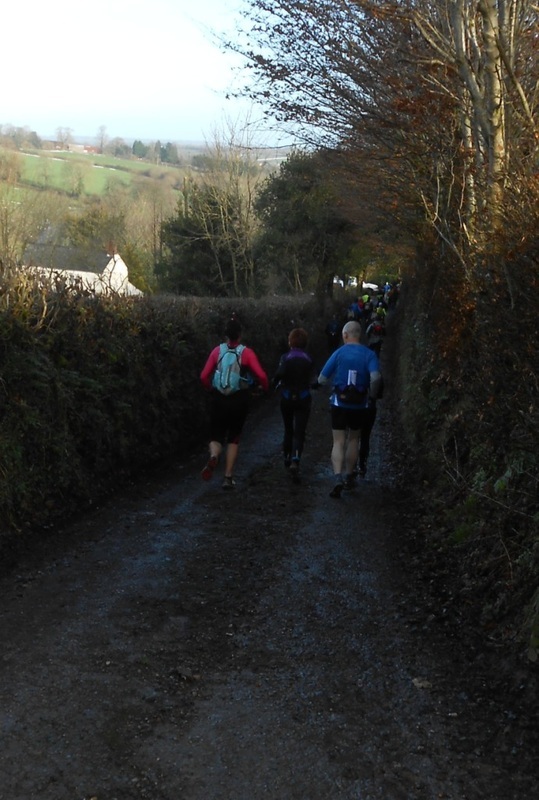 Leg 3 took us a mile along the road to Rawridge before the climb over Hartridge to Luppitt. 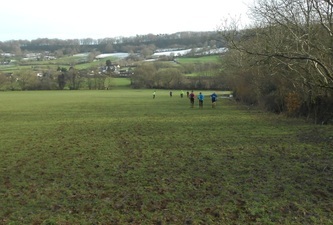 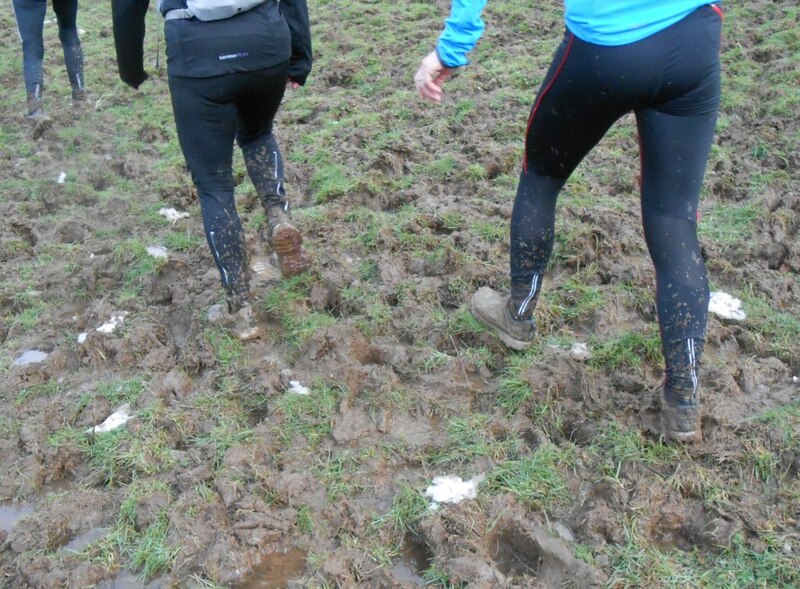 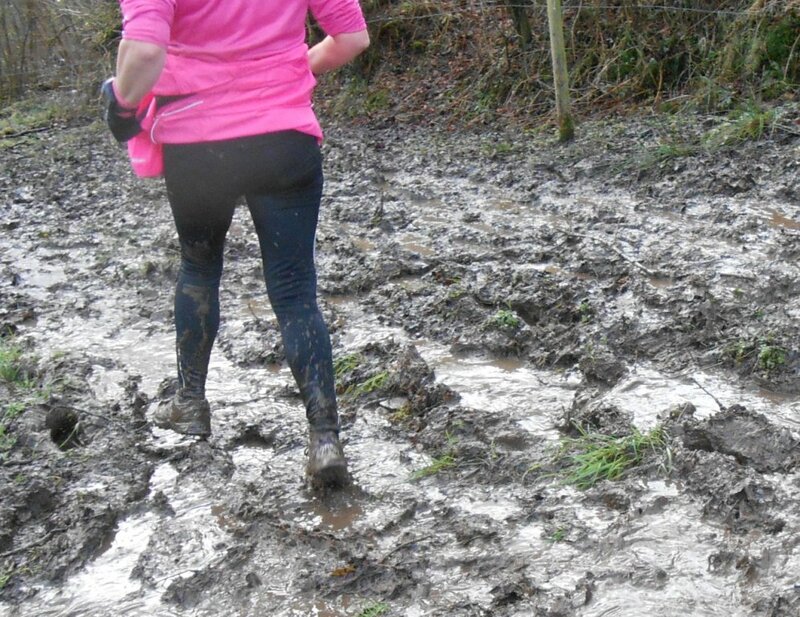 The big field just after Rawridge was an unrelenting slog, not a bit of solid ground was to be had anywhere. 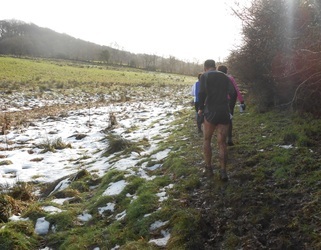 Legs were beginning to feel the strain by now and for me it was a very slow plod up the next lane and then nothing for it but to walk slowly up the hill. 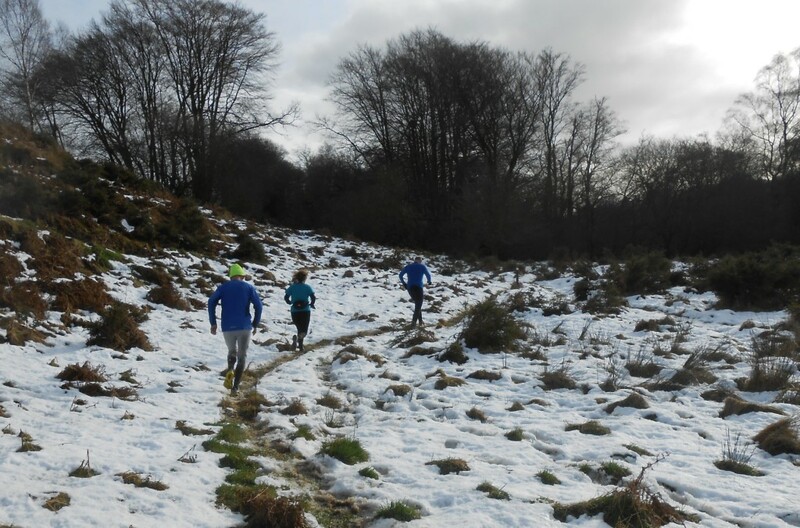 As ever on this run-walk your efforts are rewarded with stunning views and the sun shone on distant patches of snow adding to the splendour. The unique hospitality of The Luppitt Inn was something to be savoured before the final squelching grind over to Dunkeswell. 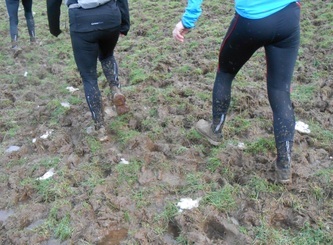 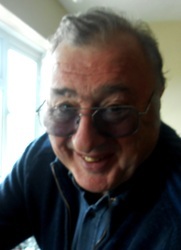 The fumbling tugging at grimy laces, and the peeling off of mud-encrusted rags that once were socks seemed to take ages before I could finally head into the warmth of the Highfield Club, for a pint and a very welcome hot dog and chips. 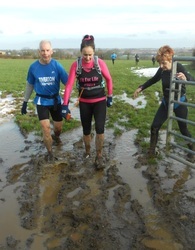 Mind you my feet took ages to thaw out - I couldn't decide if I was suffering from frostbite or foot rot. 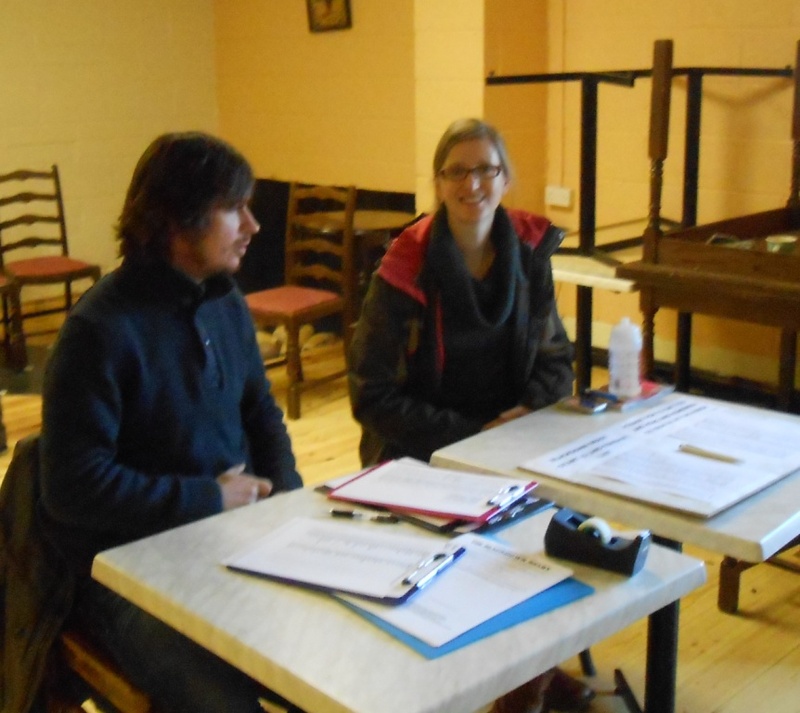 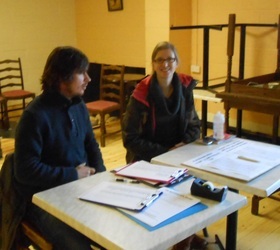 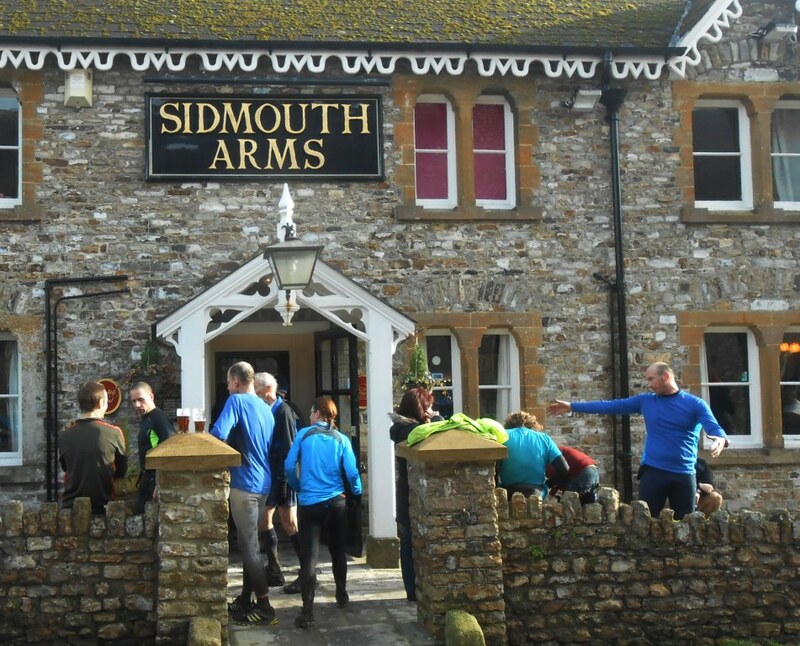 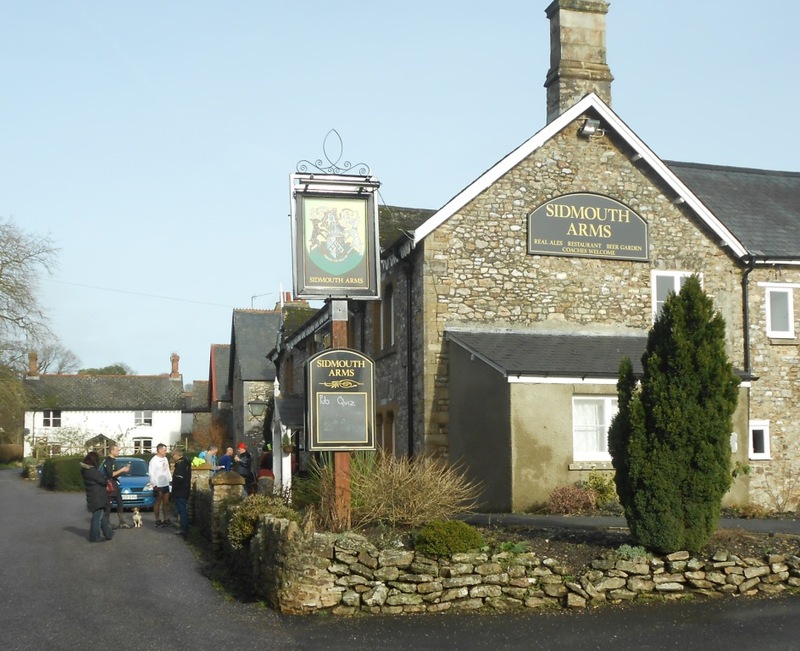 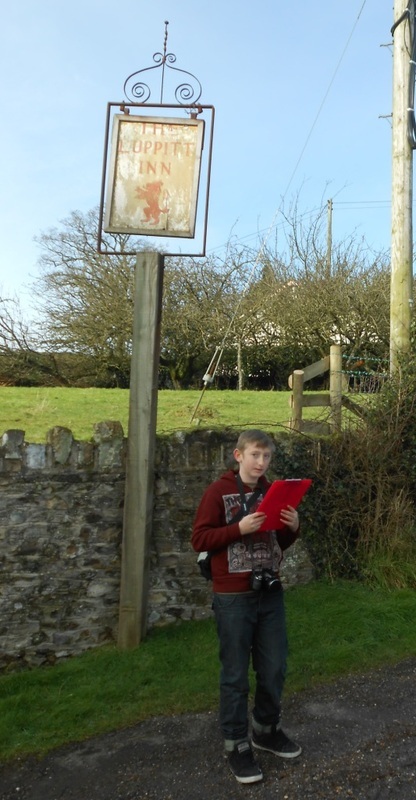 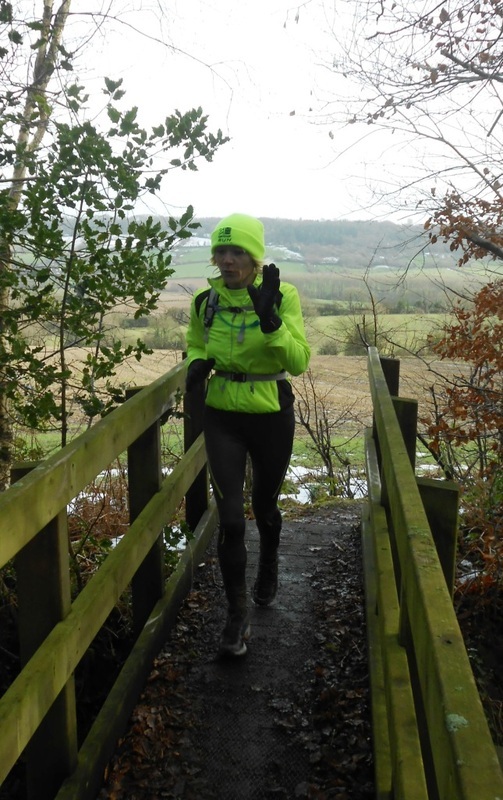 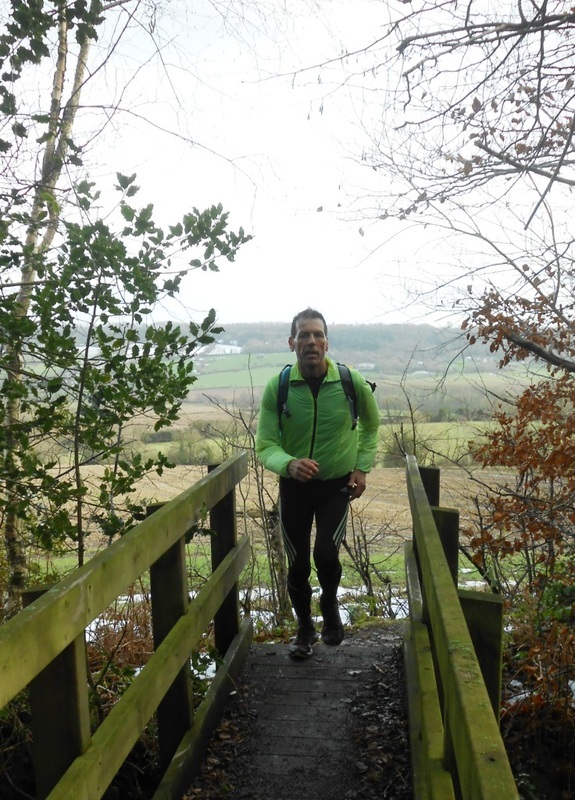 We took over £1100 in entry fees and after meeting the expenses we should be able to donate a good amount to Smeatharpe Village hall, to help refurbish the kitchen,. 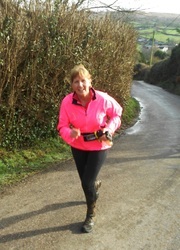 & McMillan Cancer Support. Many thanks to Smeatharpe WI and the helping husbands, to Phil Hall for driving the minibus, Fiona and Kathy for providing the emergency car and Greg for fitting in where required and for transporting the fallen runner back to base. 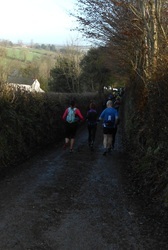 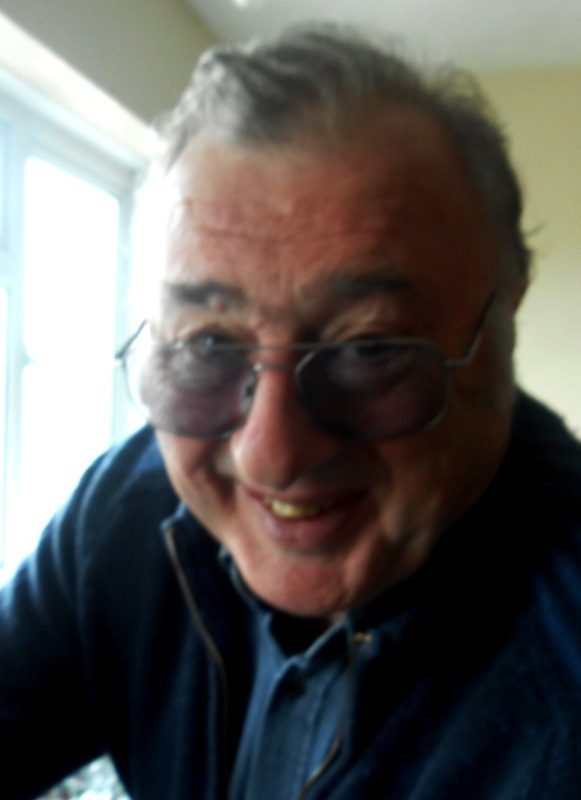 More thanks to Ian Jeeves the ever stalwart back-marker, and the team from HRC who looked after us all at race HQ.